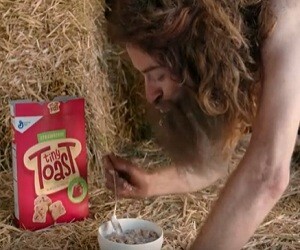 Tiny Toast’s “Humans Can’t Resist” ad campaign has generated many reactions among Internet users. And the reason why can be easily understood after watching the four commercials published on the company’s official YouTube Channel. wearing nothing but underwear, while a sheep is cutting his hair off his back with an electric sheep shear. When the guy finishes breakfast, the sheep wipes his mouth with a napkin. “Humans Can’t Resist Tiny Toast”, says the voiceover at the end of the commercial.